The last full day of the film festival is always a little sad. Even though the schedule is crammed with movies, it’s the realization that all good things must come to an end. 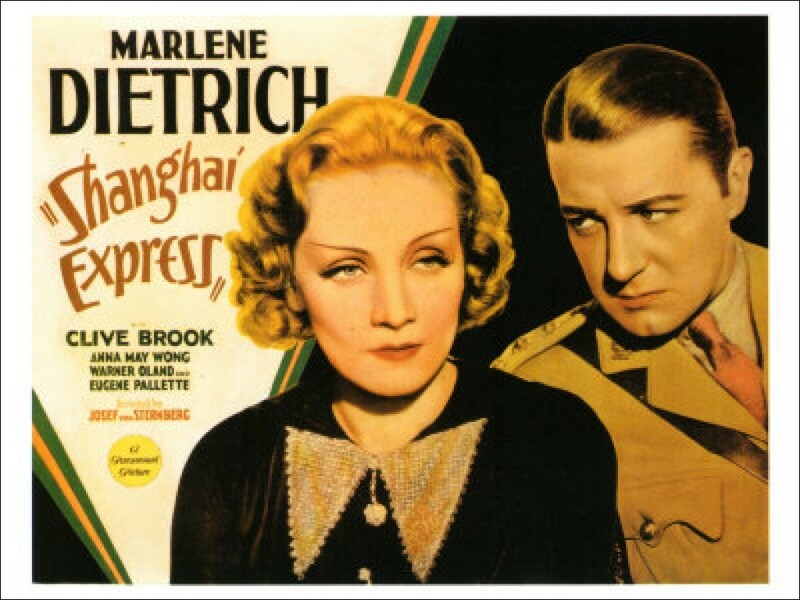 On the positive side, my Thursday strategy of seeing The More The Merrier over Shanghai Express (1932) paid off. Shanghai Express was a TBD scheduled for noon. The first movie I saw on Sunday was Carol Reed’s The Fallen Idol (1948). This film from the UK starring Ralph Richardson and Michelle Morgan was one that I had never seen before. 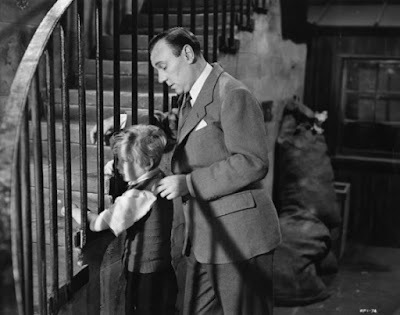 It was an intriguing tale of a diplomat’s son Philippe (Bobby Henrey) who idolizes his father’s butler, Baines (Richardson). To keep the young boy occupied, Baines made up stories about his life in Africa, a place he has never been. After Philippe witnesses a tragic accident, what’s true and what’s false gets complicated. The Fallen Idol was wonderfully directed and acted, especially by Richardson. After the movie, Bobby Henrey who played Philippe talked about his experiences making the film. Unfortunately, I had to dash before Henrey really got going in order to get in line to see Shanghai Express (1932). I had never seen the film, directed by Dietrich’s mentor Josef von Sternberg. The restoration was flawless. Shanghai Express was Dietrich’s most commercially successful film and for good reason. The story moves along briskly and is beautifully filmed by Lee Garmes who won an Academy Award for his efforts. I was especially impressed with the slow screen dissolves, which instead of being a device to go from one scene to the other, actually helped advance the narrative. Dietrich never looked more glamorous and Garmes photographed her in the most flattering light; she looked absolutely stunning. The supporting cast is a who’s who of early-1930s cinema: Clive Brook, Anna May Wong, Warner Oland, and Eugene Pallette. There was some time in between Shanghai Express and The Russians Are Coming, The Russians Are Coming (1966) so I went to the Roosevelt Hotel to hang out and visit with some people. While I was there, the folks promoting the TCM Backlot fan club had a trivia contest. 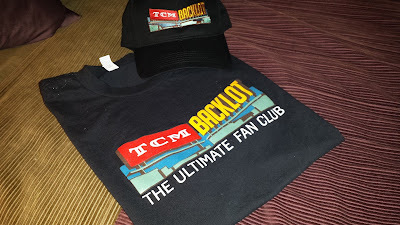 I answered a question correctly and won a t-shirt and baseball cap, both with the TCM Backlot logo. Woohoo! I was looking forward to seeing The Russians Are Coming, The Russians Are Coming for two reasons: 1. I hadn’t seen it since I saw it in the movies with my parents and 2. I was finally going to see Eva Marie Saint in person. Saint was in Chicago several years ago with Robert Osborne for a special screening of North By Northwest, but I was unable to attend. I thought, well that’s that; I’ll never get the opportunity to see her again. When I saw that she was on the TCM Film Festival schedule I almost couldn’t believe it. It’s hard to believe that Saint is 92 years old. She’s so vibrant and funny. She really enjoyed making The Russians Are Coming, The Russians Are Coming and she shared some stories related to its production that were both interesting and amusing. Though the political climate between Russia and the United States has changed since the movie was released 50 years ago, it’s still hilarious. The cast was loaded with great comic actors, including Carl Reiner, Jonathan Winters, Brian Keith, and Paul Ford. Again, even though the film is 50 years old, it’s aged very well. Well it finally came…the last movie of the festival. Once again, I chose a film that I hadn’t seen before. The film was introduced by director and choreographer Susan Stroman and Illeana Douglas. Hard to believe, but I had never seen The Bandwagon (1953) before. The musical stars Fred Astaire, Cyd Charisse, Nanette Fabray, Jack Buchanan (who stole the picture in my opinion), and Oscar Levant. The plot is a thin one, Fred is a washed up song-and-dance man attempting a Broadway comeback, but it’s really all about the dancing and musical numbers. Director Vincent Minnelli and producer Arthur Freed gave The Bandwagon that MGM polish with its vibrant Technicolor photography. Far from my favorite film musical, it was enjoyable mostly for the talent involved. After the film it was time to pose for some photos, touch base with some friends and head to the Hollywood Roosevelt Hotel to say my good-byes and prepare for the early morning wake-up call and trip to the airport.